This entry was posted in Nature notes and tagged falcons, raptors, urban peregrines, Wakefield cathedral by Francis Hickenbottom. Bookmark the permalink. Looking forward to the hatchings brilliant news and all the hard work . Iv found a small population of newts is there any organisation I can inform because where they are living at the moment they are going to be buried alive with thousands of tons of rubble thanks. We have used Hortag this year. It’s a product made for gardeners and it’s composed of baked clay granules. Ordinary pea gravel is suitable but the Hortag is lighter, so it’s easier to carry up the spiral staircase to the nestbox. It’s also useful to not have too much weight acting on the box. 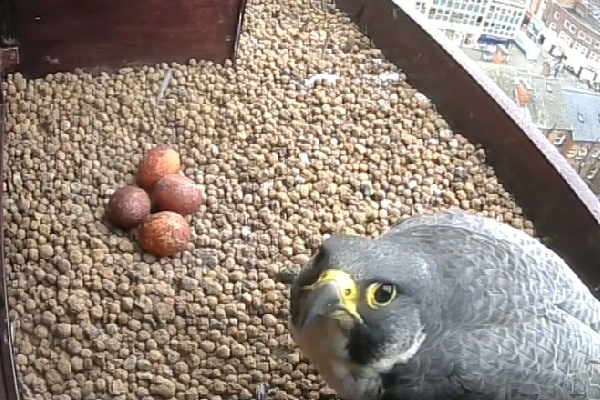 Looking at the live web cam there seems to be only one parent,As something happened hopefully not. Nick, there isn’t usually more than one adult in the box at a time. You don’t get the full picture by watching the webcam but you can be assured that both birds are present carrying out their duties normally. By visiting Wakefield centre, you can get a better idea of what is going on. This morning, both birds were quite active but they did not catch anything whilst I was there, though the male did give a jackdaw and a feral pigeon a near-deat experience. The adults appear to be absent from the nest much of the time. the adults might not be in the box but they are never absent. The webcam is interesting to watch but you can’t get a clear picture of what the birds are doing without going into Wakefield and observing them for an hour or two. There will always be at least one adult watching the box and there is always a quick reaction if any other bird ventures near the box. Also, there is a particularly aggressive reaction if another peregrine enters this pair’s airspace. The youngsters are growing well and no longer need incubation. The female may shield them from the sun during the morning but she does not need to be in the box wehn it passes into shadow during the afternoon. James, the young birds are all ranging beyond the nestbox now. Some are flying well and one is flying confidently between the cathedral and the flats. I spent today in Wakefield and tracked down all of the youngsters. There are more details on Twitter and in the Wakefield Peregrines Facebook group.